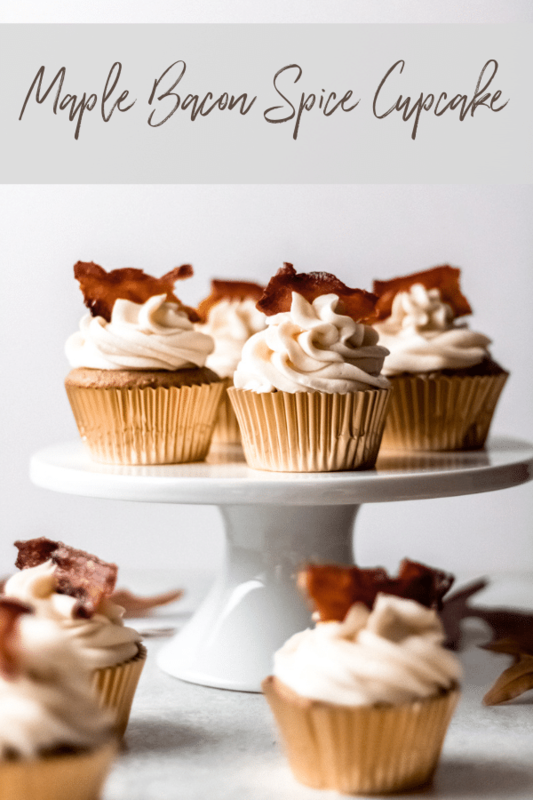 Move over maple bacon donuts, these maple bacon spice cupcakes are out of this world delicious with rich maple buttercream, soft spice cake cupcake, and topped with a piece of candied bacon. 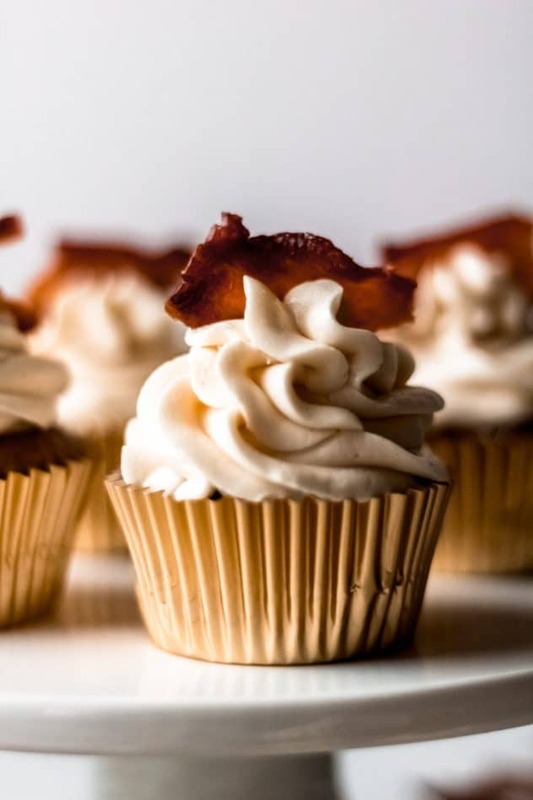 You all know I’m all about simple yet elegant eats, and I assure you that these maple bacon spice cupcakes still fit that bill. We’re going to take a shortcut in this recipe with the cake part of the cupcake, so all of your energy can be focused on the most important part – the icing!! Because if you’re like me, you want more icing and less cake. I’m sure I’m breaking some kind of baker’s golden rule, but sometimes you just need a shortcut. For this recipe, we’re going to use a box mix for the spice cake part of the cupcake. It will cut down on your cooking time and help you ease your way into baking if baking intimidates you. If you’re a seasoned pro and have a favorite spice cake recipe, feel free to use your homemade recipe! But, let’s talk about the real star of the show. 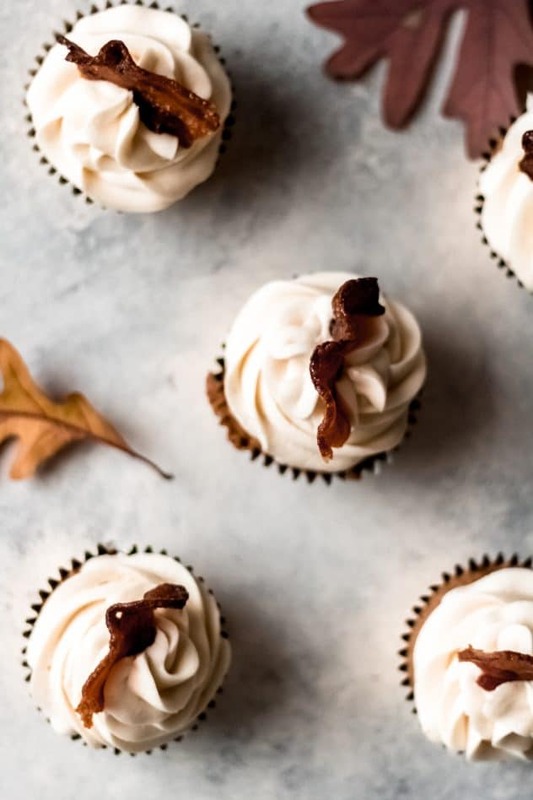 This rich maple buttercream and that piece of candied bacon! If I could use emojis in my post, I’d insert the gasping emoji here. I love buttercream, and this maple buttercream is perfection when paired with the spice cake flavors. For the candied bacon, it’s oven-baked, so it’s really simple to make. The most difficult part of this recipe would be the piping and if you don’t have any piping supplies, feel free to just pile on the icing on top with a butter knife. 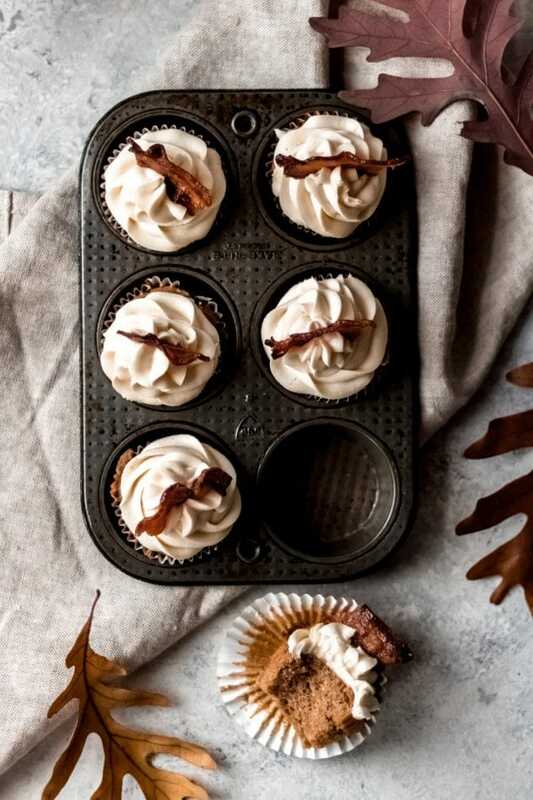 I made these maple bacon spice cupcakes for my Friendsgiving celebration this year. However, they can be enjoyed any time of year. They’d be perfect for an office potluck, Friendsgiving, or even Thanksgiving if you’re in charge of dessert. 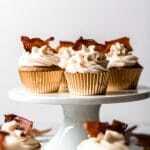 Maple bacon spice cupcakes made with moist spice cake then topped with a rich maple buttercream and candied bacon. Prepare the candied bacon first. Preheat the oven to 350 degrees F.
Line a cookie sheet with foil, then place a cooling rack on top of the lined baking sheet. In a small saucepan, combine the maple syrup and brown sugar and heat over low, stirring until the sugar dissolves. Line the bacon across the cooling rack, then brush each slice with the maple brown sugar sauce. Bake for 15 minutes. Remove from oven, flip the bacon, brush again with the maple brown sugar sauce and bake for an additional 15 minutes or until the bacon is crisp. Remove from oven and set aside to cool. Adjust oven temperature according to the spice cake mix package directions. Then, mix the spice cake mix according to package directions. Line 2 12-count cupcake tins with cupcake liners. Fill each liner with the spice cake batter about 3/4 of the way full. Bake according to package directions. Remove from oven and let cool. While the cupcakes are baking, begin making the maple buttercream. In a large bowl or stand mixer, combine all maple buttercream ingredients; beat on medium until smooth. Frost cupcakes using a piping bag and Wilton 2D tip, or simply frost with a butterknife, whichever you prefer.